"Bring on the funny man!" The full confession on this one is that I've always been more of a Keaton guy than a Chaplin guy. Yes, they're both geniuses; and yes, Chaplin was the more ambitious filmmaker. But even when his heart was in the right place, there was frequently something uncomfortably didactic about the Chaplin films widely regarded as masterpieces—his views on Fascism (The Great Dictator), for instance, or the dehumanizing effects of industrialism (Modern Times) are impeccable, but a schoolmarmy, scolding tone can creep into those movies. And nobody wants to go to the movies to be scolded. But in The Circus, it's nothing but giggles, and if it's slighter than some other later Chaplin pictures, it's still a dandy, and it's certainly a small comic masterpiece. Chaplin of course plays the unnamed Tramp, mistaken by the local police for a pickpocket—he's on the lam, and the chase lands him smack dab in the middle of the circus, which has just come to town. There he falls hard for Merna (Merna Kennedy), a lovely young woman but slightly inept acrobat; she's punished brutally by her evil stepfather, the circus ringmaster. The Tramp has his eyes on Merna, but she's looking in another direction, at Rex, the dashing young tightrope walker (Harry Crocker) who has just joined the company. You'll never see Chaplin with more animals, either—a horse in the circus has it in for him and charges him whenever he gets a chance; the Tramp is at turns brave and terrified by his encounter from inside the cage with a sleeping lion; and the comic climax of the film features the Tramp trying to replicate Rex's act while being tormented by monkeys. 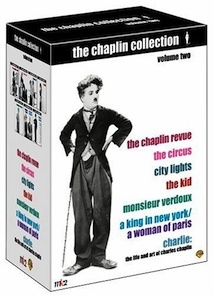 All in all, this is unquestionably one of the most delightful hours you can spend in front of your television set, and this DVD is a chance for a new millennium to learn about Chaplin's unparalleled genius all over again. Image Transfer Review: The final sequence is particularly muddy, and the print is flecked throughout with a certain number of scratches. But given the age of the film, it's a marvel that so much of it looks so good—and even if some of it looked better, you probably wouldn't laugh any harder. Audio Transfer Review: Why o why would anyone bother doing a 5.1 Dolby remix of a silent film? Here, it's principally because, in the 1960s, Chaplin composed a score to accompany the film, which hadn't been seen in decades; he even wrote a song to play over the opening credits, and sings it himself. Anyway, it all sounds fine, with only a bit of hiss here and there. Extras Review: A second disc is devoted to an illuminating set of extras. First, Chaplin biographer David Robinson provides an introduction (05m:08s) to the film, which Chaplin didn't even mention in his autobiography, for the production was so plagued with problems, chief among which was a torrent of bad publicity resulting from Chaplin's impending divorce. An installment (26m:29s) of a series called Chaplin Today is very good on the director's music hall pedigree, and on him as the rightful heir to the tradition of commedia dell' arte; it's also full of great archival footage, such as that of the very circus routines that Chaplin sends up in the feature. The only weakness here is an overreliance on director Emir Kustirica as an authority on Chaplin; he hasn't much to say. A deleted sequence (09m:46s) is great stuff, Charlie exploiting the comic possibilities of a garden rake, and being baffled by a pair of identical prizefighting twins—the fact that it was cut is an indication of just how compact and efficient the storytelling is in the feature. What's labeled as October 7-13, 1926 (26m:24s) is an opportunity to see just what a relentless perfectionist Chaplin was—it's take after take of little more than some of the characters entering a restaurant, but the director would settle for nothing less than just what he wanted. (On some scenes, he did as many as 700 takes.) A trio of home movies show us the offscreen Charlie—in the first (01m:21s), he goofs around with monkeys and pretty girls; in the second (01m:44s), he yuks it up with his United Artists partner Douglas Fairbanks; and the last, The Sacrifice (03m:20s), is a little home movie shot poolside in Hollywood splendor. Silent footage (06m:23s) from the Hollywood premiere of the film at Grauman's Chinese Theater features the arrival of such stars as W.C. Fields, Adolphe Menjou, and Rod La Roque—wasn't that a time! Camera A, Camera B (01m:15s) is a demonstration of Chaplin's method of shooting simultaneously with two cameras rolling; and some 3-D test footage (02m:23s) is not a very successful early effort—mostly, it's two guys waving their hands madly and oddly. You'll also find an excerpt (12m28s) from 1923's Circus Days, starring Jackie Coogan, onetime Chaplin costar in similarly themed material; two trailers for the film's 1960s re-release, one in English, one in French; an extensive photo gallery, an array of international posters, and clips (10m:42s in all) from other Chaplin DVD releases. Absolutely one of the funniest hours in film history, with genius gags and genuine emotion from Chaplin at the height of his powers. The second disc is valuable, too, especially regarding the filmmaker's working methods—and thanks to DVD, this circus train isn't pulling out of town any time soon. Come one, come all, to one of the greatest shows on earth!